The smell of fresh blood mingled with red dust wafts up my nose. As if to ward off the unwelcome stench, I close my eyes and begin to slow down my breathing. This is my first ever bullfight in Mérida, Mexico and I am not sure I want to be here. As we wind our way into the stands at plaza de toros, pushing through polite but determined animal activists who carry signs to abolish bullfighting, I realize not all Mexicans love this spectacle. Despite the opposition, there is a part of me that wants to experience this slice of Mexican culture of Spanish origin. I want to compare it with my memory of Ernest Hemingway’s account of the corrida de toros in Death in the Afternoon. My senses are on high alert. The hot sun beats down mercilessly while around the bullring sit the spectators; some are families with small children. Higher in the circular stadium is a Mexican brass band. Like any Saturday afternoon ballgame, vendors here hawk botanas — snacks like french fries, hot dogs con chili, tortas (sandwiches), drinks, small toys, and miniature matador capes. On the announcement board is the weight (536 kg.) of the first bull, bred at an Uxmal ranch in the south of the Yucatán state. The band strikes up and a roar from the crowd announces the release of the black beast, a regal animal with mean curved horns decorated with the colours of the breeder on his back. This bull is angry and shows it. Rocketing from the door marked toril he charges into the ring. He paws the dirt. He snorts his disapproval. He is all energy, wound up like a clock and warily sizing up his surroundings. He is beautiful and majestic. First to work El Toro is the matador’s assistant to give the matador an idea of how the bull reacts to certain moves. Then come the picadors, two heavily-padded men on heavily-padded, blindfolded horses, whose job is to stab three sets of elongated lances into the bull’s shoulders. El Toro is not amused and is uncooperative. Head down, he charges one of the picadors, who hastily dismounts and retreats to safety, leaving the horse to take the bull’s repeated gores. The horse goes down against the wall of the ring. The crowd holds its collective breath. From behind safe wooden barriers bolt costumed assistants to distract the bull from his current quarry. El Toro moves away from the downed horse. Miraculously, the heavily-padded horse scrambles to its feet, the picador leaps back onto the shaken animal and they leave the ring. Next come the banderilleros, whose job it is to thrust two banderillas (75 cm long wooden spears with harpoon-like points and decorated with coloured paper) into the bull’s back, preferably approaching the bull in a straight line and delivering the spears from a height. Watching this stage, hypnotized, one wonders how much more torment El Toro can take. His coat glistens in the blazing sun as he shakes his great head defiantly but with slightly diminishing energy. Despite the provocation, he is still regal. And now the matador takes over. With his embroidered, sequined outfit dazzling in the sun like flashing gold nuggets, he is resplendent and confident. Throughout the first stages of the fight, he has studied the bull’s movements. Now with his muleta (cape) and sword he begins the foreplay; as the muleta swirls and falls and teases and twirls, the matador shows his artistry. This is the point of fascination; this is when the matador seduces the crowd. 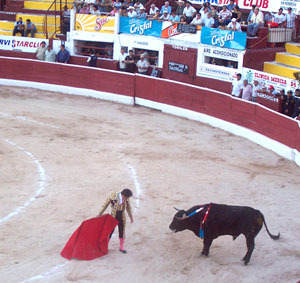 Now the classical form and passion of the bullfight come into play: the disciplined, graceful movements of the matador; the swish of his muleta as El Toro passes under it; the arched back and quick movements of the slender fighter; the closeness and oneness attained by both bull and matador; the eye contact between man and beast; the dance of life and death. Captivating, mesmerizing. We know the bull will lose this dance but at what point and how? All eyes are trained on El Toro bravo and the flashy performing antagonist to whom he is magnetically drawn. El Toro is exhausted now. Turning to face the crowd, the matador’s deliberate move to ignore the beast is his taunting way of showing spectators he is the conqueror now. The crucial moment, The Suerte Suprema, is near. Before he can deliver the final blow, the matador must be sure the bull is standing with his four feet together so the sword can easily pass between his open shoulder blades. The eyes of man and beast connect, locking one another into a world of their own. Then, at the right moment, there is a sudden swift movement as the matador lunges forward. Where a moment ago he was pawing the ground, now El Toro bravo falters and falls, leaving a pool of dark liquid in the dirt, the only evidence of a valiant fight he has lost. In what seems a moment later, the noble animal is unceremoniously dragged from the bullring by mules, after which he is immediately butchered and his meat delivered to the poor. There are a total of six bullfights during an event, each one divided into three parts, the last part being the face-to-face fight which ends with the death of the bull. Each bullfight takes no more than 15-20 minutes.